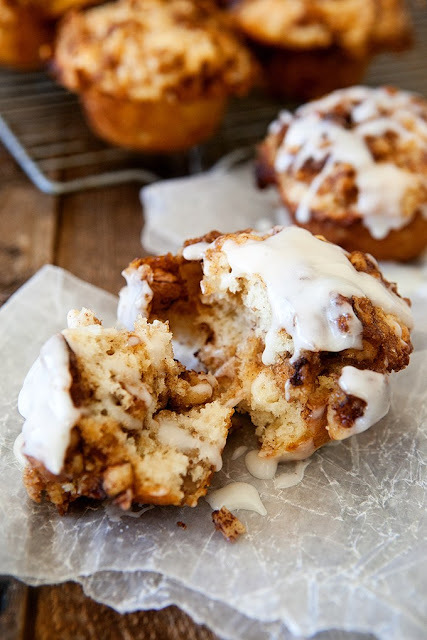 I am swooning over these Cinnamon Roll Muffins! Everything you love about a good cinnamon roll, but ready in a fraction of the time. These Cinnamon Roll Muffins require much less of a time commitment, but one sweet bite and I think you’ll agree that they make a pretty impressive substitute for standard cinnamon rolls. These are easy to make, but I have to tell you that it took me a few tries to get this recipe right. The first batch I delivered to my mother were much too crumbly and the brown sugar – cinnamon topping exploded all over the pan. But I knew in my heart of hearts that Cinnamon Roll Muffins needed to exist in my life so I persisted undaunted. Thirty-six muffins later, I am now happy to report that I have achieved not just success, but in fact, perfection. After consuming a couple of these gooey, sweet, perfect muffins, I feel bold enough to declare that these Cinnamon Roll Muffins might very well be the best thing I have ever managed to cook up in this humble little kitchen of mine. They are that good. No joke. Preheat oven to 400 degrees Fahrenheit. Generously grease a standard 12 cup muffin tin. In a large bowl, sift together the dry ingredients. In a separate bowl, whisk together the wet ingredients until well combined. Make a well in the center of the flour mixture and add the egg mixture, stirring only until just combined. Combine all the topping/filling ingredients. Gently fold half of the mixture into the muffin batter. Spoon the muffin batter, about ¼ cup, into each muffin tin. Top with remaining brown sugar mixture. Bake at 400 degrees for 12 to 15 minutes, or until muffins spring back when pressed lightly. Remove from oven. Cool slightly, then transfer carefully to a wire rack. Whisk together all of the frosting ingredients. Drizzle over the top of the muffins and enjoy every single delicious bite . . . maybe even lick your fingers when you're done.